Pet Shop Boys and Poker... no clue. My take on what texting is doing to the language. i AM clueless. You just got me to listen to a techno song--twice. Once to see the lyrics while the song played, a second time to see the original video. Not my kind of music. "Integral" by the Pet Shop Boys--it's taken straight from "We" by Yevgeny Zamyatin (the "first" dystopian novel). The song makes me think of "Another Brick...2" by Floyd (lyrics, not music). That is a really clever cartoon. You could not have picked a better QR code as commentary for "modern" times. How did you know about it? If you picked it at random, it will blow my mind. 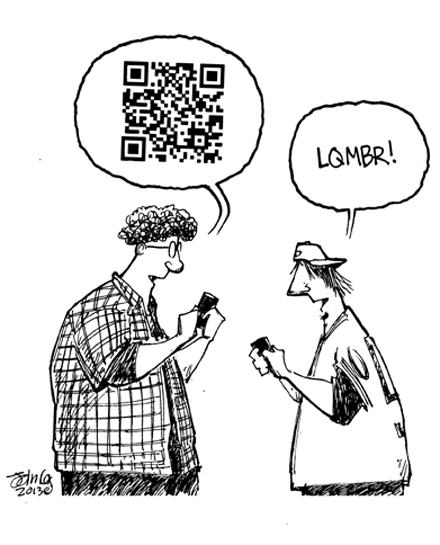 FWIW, I don't have a device that reads QR codes. Donkeyrock's comment pointed me in the right direction. Met up with a friend I hadn't seen in 7 years. Went to the local Starbucks for coffee and conversation. Place was like a library. Everyone, even those at the same table, had their heads buried in their iPhones. Sunday went to the local mall. Almost got run over by a mother and her two teenagers - all walking along with their heads buried in their techno-gear. Scanned the code, checked out the result. The QR was random pull from google images. I have no way to know where that visual link leads. You know what started all of this? Obviously Devin is the only one qualified to comment. LQTMST. This page contains a single entry from the blog posted on May 2, 2013 12:01 AM. The next post in this blog is Haiku What?.